I had seen this a while ago thanks to a dear friend who wishes to remain anonymous, but now that the link has been made public in other sites there's no reason to keep it under wraps any longer. A splendid preview of a soon-to-be-released video about the The Rebbe's early years. Recommended for Jews of all stripes, especially you Lubavitch haters out there. I had the opportunity over Yom Tov to spend considerable time in other Charedi circles, something I don't do very often. Chabad does that to you after a while, for better or for worse you begin to stick with your own. Why do we not have this? Why did the Alter Rebbe omit such beautiful Zemiros from his Siddur? Don't get me wrong, we have beautiful Niggunim in Lubavitch, Niggunim that can take you to true spiritual heights and that awaken even the soul in the deepest slumber, but wouldn't words do a better job? Words that express the beauty of Shabbos, the laws of Shabbos? So I thought of a story. Reb Shmuel Munkes once came to a village of simple Jews during Chodesh Elul and spent the whole evening farbrenging with the locals. Late at night they finally finished and went to retire for the night, or so he thought. After a very short nap he was awakened by his host. "What's Selichos"? asks Reb Shmuel. The host could not believe his ears, an old distinguished, learned man not knowing about Selichos! So he launched into long explanation of how we ask of Hashem to forgive our sins so that he'll give us we want. The cows should give lots of milk, the crop should be plentiful and so on. and proceeded to return to bed. Meaning that such Selichos he didn't want to say. Maybe he said it later, I do not know, but that's not part of the story. Many of the Zemiros speak of the Macholei Shabbos, elaborating and expounding on the fish, meat and wine that we enjoy on Shabbos. The AR was not very fond of this. Is that maybe what he had in mind? 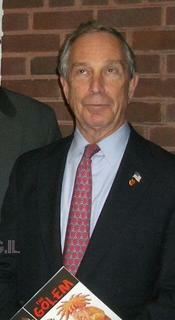 Mayor Bloomberg in Crown Heights last night. I need to work this year on Chol Hamoed, a first for me, and a painful subject, so I daven early in a local Chassidishe Shul. The looks I get from the local yokels when I withdraw my 26 Hadassim Lulav reminds me of Mivtzoyim in Brighton Beach or Manhattan. Am I that much out of touch with my Charedi neighbors? Don't they need to know that there are different Minhogim concerning Hadassim? Harav Yisroel Grossman is מזקני חסיד קרלין , the father of Rabbi Yitzchok Dovid a.k.a. "The Disco Rabbi", and an old time Yerushalayimer Yid. He was also Rosh Yeshivah in Tomchei Tmimim in Lod, but that's beside the point. In the Sukkos issue of משפחה he recounts some of his life's stories, including many new revelations like the fact that Rav Isser Zalman's wife called him "Zhunye", but that too is beside the point. When it comes time to recount the difficult and heartbreaking periods of the early days of Medinas Yisroel one issue takes center stage, namely the fact that most Charedi Mosdos would NOT accept Sefardi and Yemeni immigrant children into their children. The Jewish Agency was rightfully accused of taking children from Religious homes and placing them in secular schools. A board (what else) was set up to counter these moves and they met with the Agency brass. Their answer was simple, "your Mosdos don't want to take them so we do"! Reb Yisroel agrees with the notion. "Unfortunately they were correct". At one of these meetings a Jewish Agency official took aside Rabbi Grossman and told him "why should we argue over facts, let's go and see which are the Mosdos HaTorah that are willing to accept these children, any child that will be accepted in a Yeshivah will be allowed to go study there". What he found out was truly shocking, the only Mosdos that would accept these children were "Batei Avot", a Mosad established by the late Ponovizher Rov, HaRav Kahaneman, and Yeshivas Tomchei Tmimim in Lod. You make ask, "Tzig, why differentiate between the two"?, why give Tomchei Tmimim the bold and italics and not Batei Avot"? The answer is simple. Tomchei Tmimim, under the Rebbe's directives, accepted these children AS EQUALS, unlike BA. Talmidim of Tomchei Tmimim of Middle Eastern descent received a full Chassidishe Chinuch.
" I stood at the these other Mosdos כעני בפתח and begged them to accept these children, but they just shrugged their shoulders and refused." The Jewish Agency official stood by and watched all this happen, and I stood there shamed. "Ribbono Shel Olam", I screamed, we're speaking about the children and grandchildren of the greatest Sefardi Rabbonim, they will have no Chinuch if we don't do it! The end result was that hundreds were educated in exisiting mosdos, but Thousands were lost, and for no reason. Why all the screaming and condemning of the secularists if nobody cared enough to save these souls from Shmad?! Most of all, how dare these same people condemn Chabad? Meanwhile, in the Hasidic village of New Square, N.Y., religious leaders recently issued a document reminding residents that "women should not sit in the front of a car." "It's considered not tzniusdik [modest] for a woman to be a driver, not in keeping with the out-of-public-view [attitude]," village spokesman Rabbi Mayer Schiller said. "If you can imagine in Europe, would a woman have been a coach driver, a wagon driver? It would've been completely inappropriate." The village's religious leaders have made an exemption for an 80-year-old woman who was one of the community's original residents and hadn't known about the driving prohibition before she moved there. In the recent document, New Square religious leaders reiterated the prohibition against girls riding bicycles; also, women are forbidden from going outside in their long housecoats ?? a common fashion staple in many Orthodox communities. The rules "are nothing new," Schiller said, but "there's just a sense that for some of the young people they need to reinforce them." He added that in the village's entire history, similar comprehensive lists of communal standards have been posted "maybe five or 10 times, but probably no more than that." "If you would poll the community... 97.5% would say, 'Yes, this is what we want,'" Schiller said. The recent document in New Square addressed a wide range of prohibitions. One rule requires that a fence be constructed around houses that have a trampoline. Another states that exercise groups can be formed only with the permission of a rabbinical court and that they require a mashgiach (religious inspector) to oversee them. Some of the regulations are targeted at men, including a clause instructing male worshippers to keep their cell phones off and to refrain from talking during prayer times. But it is the rules pertaining to women in particular, those related to driving that bear a striking resemblance to the Saudi practices criticized by the Bush administration. In some ways, Saudi Arabia's laws regarding women are more permissive than the religious edicts in New Square. For example, a Saudi woman is allowed to ride in the front seat of a car if the driver is her husband. While husbands and wives in Saudi Arabia are allowed to walk with each other, New Square men and women always must walk on different sides of the street. In strong contrast to Saudi Arabia, the government does not enforce the religious rules in New Square; violations do not result in any form of corporal punishment. But those who frequently violate the rules in New Square are blackballed from the community. "I can think of just a handful of cases over the years" in which someone was expelled from New Square's religious community, Schiller said. "I don't think any of these transgressions would get you to be expelled from the community," Schiller said. But, he added, "If a young woman was driving, that would be fairly serious." Schiller warned against drawing any negative conclusions about New Square based on the Saudi situation. "It is a mistake to view a religious practice negatively just because another culture, aspects of which we may find troubling, also practices it," he said. At the same time, the New Square spokesman was critical of the Bush administration's efforts in the Middle East. "American foreign policy has moved towards a messianic, crusading secularism which judges all other peoples by the standards of our own 'fashionable' elites," he said. "This monolithic utopianism inevitably yields spiritual, moral and practical disasters." You gotta love this guy. Especially the anti-war rant at th end. I happen to know him from a long time ago and this guy believes in these Takonos like he believes in the Koran, but he sells it well. They may have a point, and they mean well, but it sounds awful when it leaks out to the press. Besides, I think they're suffering from "we- want- to- be- the-frummest" disease. Dovid Goldwasser is a name you heard of if you listen to the "stimulating" talk on the Nachum Segal show, or read the fascinating articles in the Jewish Press or Country Yossi. If you're like me you probably think "this guy is so full of himself it's a wonder he doesn't just explode". If that was his only crime דיינו , but here's what else he's done. Reb Mottel Lifshitz was a Shochet and Mohel in Moscow all throughout the dark days of the Soviet Union. He was a Lubavitcher Chossid, a Talmid of the underground Yeshivos. Needless to say he had a fascinating story to tell. When he left Russia he somehow got to know Goldwasser who smelled a good book to add to his shining resume. So the good Rabbi got the unsuspecting Mottel to give him the manuscript to have it translated into English. It had been published previously as a Yiddish book entitled "זכרונות פון גולאג" and was ready for the English version. "I do not take part in the attempt to erase the history of my dear Rebbes who stood by me in my dark days in Soviet Russia and its gulags." What kind of a man would do something like that to a broken, old man?! and he calls himself a Rabbi?! Is Malkiel gonna come for you? Lakewood Takonos regarding all aspects of technology, mainly internet and those dreaded cellphones. Maybe they mean well, but it sounds all wrong. Who's going to enforce these rules? Will they squeeze the information from the children? Who are the Gedolim they speak of? The story goes that a Chossid was lying on his deathbed and starting saying Viduy. That's not to say that I do not what to do Tshuvah for. Seems Like Nathan Kamenetsky has finally reprinted his previously banned biography of his illustrious father. The problem is that it seems that the only controversial parts removed were the ones where RAK refers to a Talmid interrupting his Shiur as a Poroh Adumoh. I guess the Kotlers were the only ones who tried to clean up their patriarch's image after it was tarnished in the book. The derogatory references (at least by today's standards) to all others do not matter as long as Lakewood is appeased. At least the jacket's still the same.